Description of "Lumbini to Kushinara"
Lumbini to Kushinara takes the reader 2600 years back in time. Siddharth Gautam was born in 583 BC in a place called Lumbini which is in Nepal today. Eighty years later he died in Kushinara, which is in India. This book traces the path that Siddharth took in these eighty years. This is the story of the life and times of Siddharth who later on became the Buddha. How and why there was this transformation from his being a prince to an ascetic who propounded a Philosophy which became a major Religion of the World, is the theme of this book. It is not a travelogue nor is it a religious discourse. This is the story of a person who walked the earth 2600 years ago and his footsteps are still being followed by a large number of people all over the world. Varsha has travelled to almost every part of India. Her travels have also taken her across the length and breadth of Europe and America and also to some parts of Africa.Traveling and reading have been her favourite hobbies, and she is capable of reading anything that she can lay her hands on. A few years back while travelling by train if she didn't have anything else to read she would even read the Bradshaw and learn everything about the places that she went by in the train. Varsha's love for travel and reading has brought her to this juncture where she has written this book about a journey which takes you back about 2600 years to 600BC. Professionally Varsha was a Banker, and took a slightly early retirement from the Bank, so that she could pursue her favourite activities without any hindrance and bindings. This is her maiden venture in this genre of writing. Reviews of "Lumbini to Kushinara"
and of course your truthfulness to your writing, that's why one can easily experience the aroma of these places.Though the book doesn't contain the philosophy but if one is acquainted with the philosophy of Budha the least , one can have a fair knowledge of his philosophy ....Mainly the four noble truths." The book gives a brief overview of the Buddha’s life, along with a description of the places he lived in. It is written in the first person, as a travelogue, taking us through these places--Lumbini, Kapilavastu, Sarnath, Sravasthi and others, up to Kushinara, where he attained parinirvana. An attempt to separate legend associated with the Buddha from historical detail is done. The role of important personages who came after--Asoka, Kanishka etc--who did much for the spread of Buddhism, is also touch upon. Two facts that I learned from the book was that Siddhartha, the prince, did not ‘run away’ from the palace one night, as the legend goes, but was forced into exile—with the knowledge and acquiescence of his wife--due to certain unusual circumstances; and that he had no intention of propagating a new ‘religion’. His purpose was to advocate balance in everything one did, in order to have a fulfilling life. This book is a recommended carry-on for anyone visiting the places connected with the Buddha; it will enhance the quality of the trip. 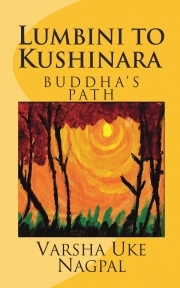 I have read Varsha Uke Nagpal book on "lumbini to Kushinara "--Buddhas Path. It's a very well researched text based on visit to actual places connected with life of Siddhartha Gautam who became Buddha after enlightenment. The book takes us back to 2600 years on the path travelled by Siddhartha Gautama - born at Lumbini, become enlightened at Gaya under a peepal tree and achieved mahaparinirvana at Kushinara at the age of 80 years , all on Vaishaka Purina under open sky. The accompaning pictures and maps are very useful and informative. I enjoyed reading the book. Although the book is not a religious text but it is worthwhile to mention that -- Buddhism was never meant to be a religion , it only taught " Dhamma "
The travelogue by Varsha Uke Nagpal is not journal like record but a sincere effort of research to synthesise Geography, History. Philosophy of Buddhism.Earliar historical travel accounts of Fa-Hian, Huen Tsang etc place much emphasis on study and collection of Buddhist Scriptures and their description on Lumbini , Kapilvastu,Kushinagar etc. lack the locational certainity and sometimes they depended more on heresay and myths.VUN throughout the book kept away from controversial issues of histriocity and maintained objectivity in location of sites associated with the life of Buddha, the Great Teacher of the World as described by World historians.Bermese and Ceylonese chroniclers while err in naming in rivers,rulers of Janapads,people associated with Buddha, VUN's research while settles such controversial issues, she has preferred simple and lucid style of writing in covering the related aspects without placing much burden on the mind of reader to enable him/her to retain interest in the completion of book in one sitting.Photographs. Maps and Tables in the book enrich the content.Great effort by Versha Uke Nagpal indeed. It was an enjoyable reading Lumbini to Kushinar . Varsha is a good narrator of history . The writing juxtaposes the 21st century and 6th Century BC, bringing alive the past era very interestingly . The political climate of the times of Buddha , and his struggles to spread his teachings has been graphically written along with 21st century perspectives . This is a wonderful book for those wishing to do the Buddha trail . Perhaps a Bibliography would have been useful to a piece of history well narrated . A very good account of the life and teachings of the Buddha. Simple but compelling narrative style with a wealth of information on INdia in ancient times. Retracing the Buddha's journey through life Varsha Nagpal has, in a simple yet thoroughly researched text produced a fine introductory book about the Buddha, the essence of his philosophy and the context in which it evolved. The quality of the text, its presentation and the accompanying maps make for a very easy and enjoyable read. Both children and adults will find fulfilment in retracing the Buddha's path with Ms. Nagpal as she leads the way. Just finished reading "Lumbini to Kushinara," a gripping account of Gautam Buddha's life and teachings. In a few hours, I travelled with Varsha Uke Nagpal from Lumbini to Kushinara and what a fantastic guide she has proved. Revisiting history, navigating geography and learning philosophy, the journey has been quite a handful. I was transported back by 2600 years and learnt so much in no time and without any effort. Succinct language is indeed Varsha's forte. Looking forward more from the pen of this accomplished traveller in pursuit of historical facts and providing them her own interpretation. Varsha asks “Could any person have lived a life of seclusion for 29 years without knowing anything about illness, old age and death?” she does not agree with this and says that there had to be something more realistic in Siddhartha’s world. Yes I do agree with that but what is more realistic? We all grow up and witness illness, old age and death all around us. Though this does cause anxiety in our minds we end up helpless and insecure. The awakening occurs when the search for a way out of this ‘Dukka’ begins and that’s what happened to the Buddha and may be that was when he was 29 years old. Buddha’s four noble truths summarized by Varsha in her book, are based on the recognition that life is filled with ‘Dukka’ and that there is a reason for it and it is only by renunciation that one can overcome it and for this the Buddha prescribes his eight fold path. When I compare this with the existentialist view that life is filled with ‘angst’ (anxiety) and the only way to overcome this is through living an authentic life, I ask myself whether Buddha can be called as the first existentialist. In the epilogue Varsha summarizes the philosophy of Buddha in her own simple style so that it remains in the mind of the reader; delightful book and an enlightening journey. History is reputed to have 3 stories or versions. On of the "victors", one of the "loosers" and the third of what might be closer to the truth of what happened. This book is beautifully written, very easy read, actual pictures of the author's visits and it gives you the THIRD version of the history, with logical reasoning and explanation. We have all heard about Buddha and the path he traversed - about 2600 years ago. This book takes us on that path and dispels the half-truths of the historians over the ages. It demystifies his persona and logically leads to what the greatest philosopher thinker has propagated in his thoughts that have become the most followed religion in today's rational world. A must read for anyone who has the slightest interest in this philosophy and a must read for those who wish to learn from this well-researched book.